After leaving the Elk Garden Methodist Church, I rode about an hour to Honaker where I had a CARE package from Lynn waiting for me. After picking up my package of goodies, and loading my bike with my newfound treats, I started the all-day process of munching on gorp while I rode my final day in Virginia. The hills are still here, and still fairly frequent, but they seem to be getting less severe in inclination although perhaps longer in length. Near Davenport, I stopped in the middle of one climb to take a rest and ended up having a conversation with a couple of women taking a break from the pharmacy I had stopped next to. We ended up talking about the area, and about life, and about bike rides, and I think that by the time I was done talking to them I almost had them convinced to buy bikes and try riding across country themselves. 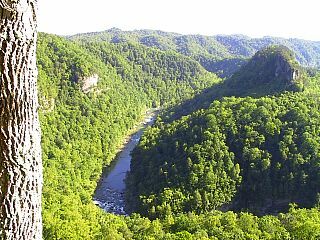 Eventually I made it to Breaks Interstate Park, which straddles the border of Virginia and Kentucky. After I arrived I set up my camp and took a long hot shower, then just had time to cook dinner before the sun set. As I was finishing dinner I heard a sound behind me and turned around with my flashlight to spot four glowing eyes peering back at me. Two raccoons had decided to come looking for handouts and were no more than ten feet away from me. A couple of hollers from me scared one of them away, but the bolder of the two kept coming my way no matter how I waved my arms or scolded him. Finally, when he was no more than four feet from me, I simply charged him. He didn't seem to expect this move as it sent him scurrying. 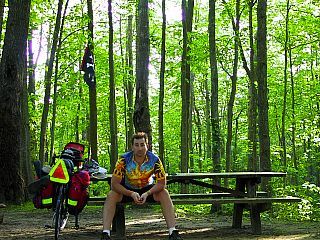 I proceeded to secure everything I had, and brought the pannier containing my food into my tent for the night so that it could be "safe". In the morning however, I discovered that I had left one thing out and those rascal varmints had taken it. The raccoons stole my bottle of olive oil. I decided that I needed a day of rest, and Breaks seemed like as good a place as any to do it, so there won't be any riding report for the 16th. I ended up spending Thursday pretty much just snacking and napping, and that wouldn't make for very interesting reading. You'll remember that I had ridden for a few days with Ed Gibbs. Well, Ed and I had kept exchanging messages but it became clear I wasn't going to catch up with him. The good news is that Ed finished his ride across the state of Virginia and has caught his ride home. He had set out to complete this one state, and I congratulate him for accomplishing his goal. In honor of completing Virginia myself, I would like to share four things I've learned along the way. 1: I hereby declare possum to be the official road-kill of Virginia. 2: Flying insects can't catch you if you ride about 3.5 mph. 3: While peppermint soap may sound nice in theory, it isn't a good idea once your "parts start getting tender". 4: Raccoons love olive oil. Hahaha, its the little things in life we learn that are so darn interesting. I had to play catch up on all your posts but I have to admit I was glued to them like a good book. The pictures you have been posting are beautiful and I wish I could be there to see some of the sights. Keep on keeping on brother, this will be a time of your life you will never forget or regret. You have my prayers.